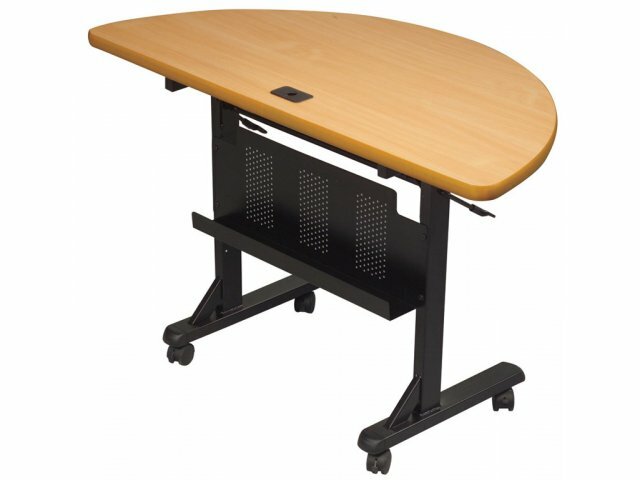 Half-Round Flipper training tables can be added to the ends of two back-to-back rectangular tables to create a large conference table. 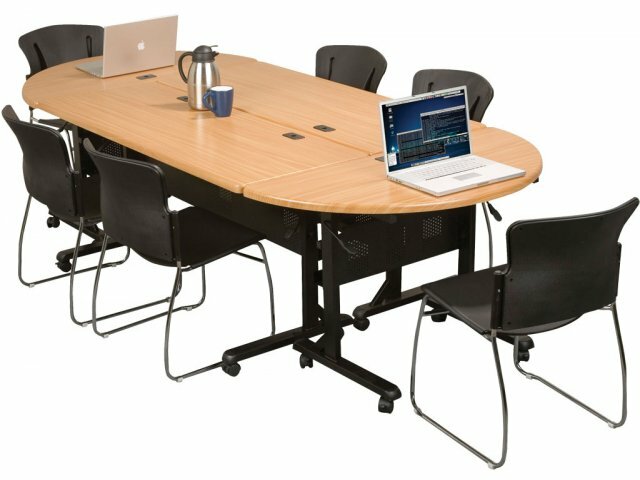 These semi-circular seminar tables are also great for team-building projects and exercises in business training seminars. Balt Flipper training Tables help you create multipurpose work areas in conference rooms, training rooms and offices. 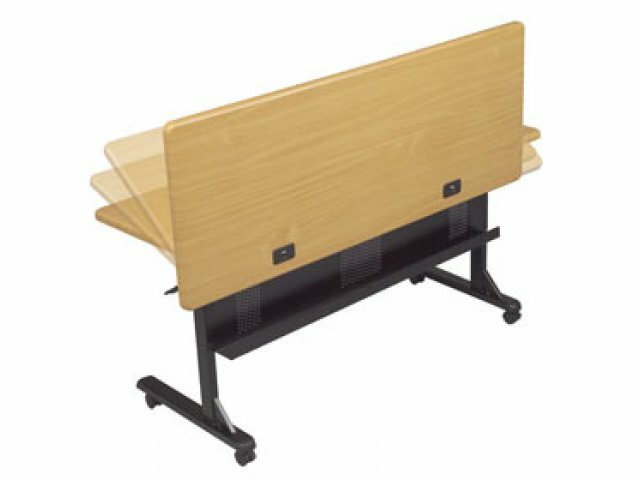 These seminar tables are versatile, mobile and easy to store. They roll to desired location on 2" casters, and lock in place. With the flip of a lever the tabletops fold upright and nest into each other for compact folding table-storage.These seminar tables provide all of the features needed in a modern business setting. A built-in cable tray and wire-management grommets make it easy to hook-up laptop computers or other electronics, while keeping wires out of the way. Set training tables up in rows for seminars, or combine multiple tables to create one large conference table. Team Building: Semi-circular tables enable participants to see each other while seated. Versatile: Create a conference table by placing rectangular units back to back with half-round table on each end. Feature Packed: Includes modesty panel with 2½"-deep cable tray and grommets. Comfortable Work Space: Tables feature a radius edge for added comfort. Strong: Black powder-coated steel frame. Space Efficient: With the flip of a lever the tabletops fold upright and nest into each other for compact storage. Table depth is 24" when in folded position. Each additional table nested adds 4"depth. 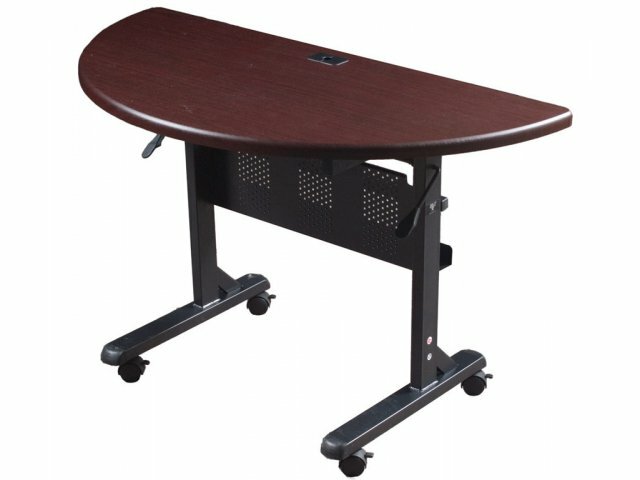 Portable: Tables roll into position on 2" casters (2 locking). Durable Surface: High-pressure laminate tops are scratch- and stain-resistant, yet easy to clean.